I’ve read all 182 tedious comments, which I cannot recommend because the majority are non-referenced complaints from boosters. Approximately none of the Economist commenters had read the Frank paper. So my take is you can skip #1, read #2 for a good introduction, then work your way through #3. Figure A is a nice graphic produced from Figure B which is the “money table” of the Frank paper. I’ve included Figure B so you can quickly grasp what the Cost vs Benefit bars mean in the graphic. There’s a minor error in the graphic: the Wind cost/benefit bar is missing the mark for “net benefit” which is a negative $25k/MW not zero. Most important is that Frank’s Adjusted Capacity Cost does not fully reflect the negative reliability impact of VRE. Dr. Frank does not examine how Net Benefits vary with VRE penetration. Detailed modeling shows that increasing VRE has large effects on reliability. Capacity Credit for VRE generation is inversely proportional to penetration. The more wind/solar you build the less marginal value you get. The Frank paper is directed at a future powered by less coal (that’s good) but not a zero-carbon future (which we must achieve). If we build a strategy for the goal of Zero Emissions we will still likely build Gas CC in quantity because it is fast to build, relatively cheap and politically acceptable. But looking out a century to achieving Zero will help us focus on ramping up nuclear as fast as feasible and safe. We cannot wait 50 years to get started. Sensitivity to Carbon Prices: In Tables 9A and 9B, the net benefits for both wind and solar are negative. 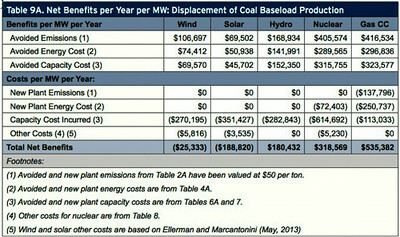 However, if the carbon price is increased from $50 to $61.87 or above, then the net benefits of wind are positive (as shown in Table 11). Above $185.84, the net benefits of solar are also positive. My interpretation of that result is that solar costs at least $185/ton CO2 avoided. For a society with finite resources, the cost/ton of CO2 abatement is a rather important number. Sensitivity to Natural Gas Prices: The results in Tables 9A and 9B are highly sensitive to historically volatile natural gas prices. In the United States, the average annual cost of natural gas to electricity producers reached a high of $9.01 per million Btu in 2008. The average monthly cost reached a low of $2.68 in April 2012 (EIA, November 2013, Table 9.10.). The variation among countries, and the effect on net benefits, is illustrated in Table 12. Note that nuclear becomes the highest net-benefit policy when gas prices exceed about $9/MBtu. Current UK prices are above that level, which is where US prices were only six years ago. My bottom line is: this paper is good starting point. Please keep in mind that the true cost of variability for wind and solar is significantly understated, as the value of VRE falls as penetration increases. Still, I appreciate that adding complete VRE analysis would have made this paper much more cumbersome. From the Potsdam Institute for Climate Impact Research, a serious piece of work on renewable integration costs.